Twice the traffic in half the time? 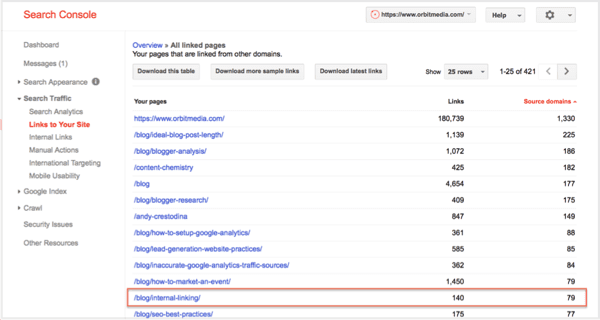 How to update old blog posts for better results fast. You wrote it years ago. It did well at the time. People liked it …and clicked, opened, commented and shared it. But then you and your readers moved on. You never looked back. But maybe it’s time to revisit those old articles. Maybe it’s time to update old blog posts and republish them. Maybe bringing old articles up to date is the best move we can make as content marketers. You’ll rank higher in search because an older post may already have some authority. In other words, you’ll get better results with less effort. 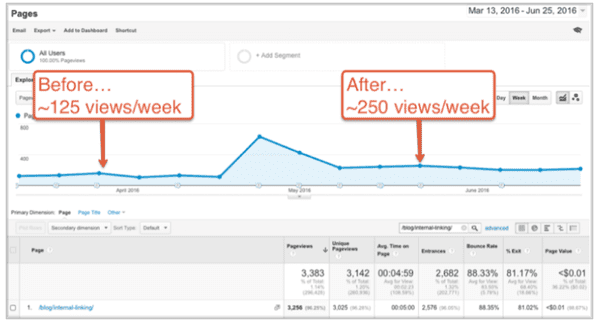 In our example here, I’ll show you how we got twice the traffic in half the time by updating an old blog post. Four years ago, we published an article with advice on internal linking. People liked it at the time. It explained how to link between articles in ways that are good for visitors and search engines. Then we forgot all about it. But surprisingly, this post kept getting traffic. It was optimized for the phrase “internal linking” and ranked well. 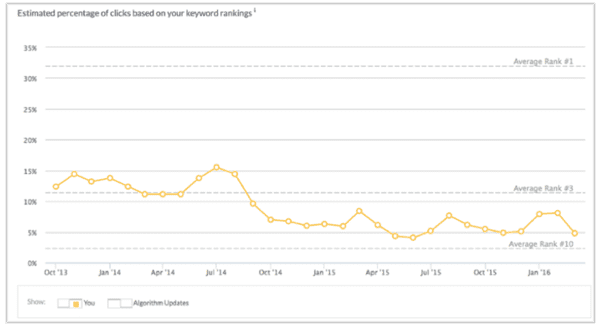 We tracked our rank using Moz, and over the years, we watched that rank slowly drop. This chart shows the long slow drop in ranking over several years. And as rankings fall, so does traffic. This post once enjoyed 300 visits per day. But that number was falling to just over 100. Here are the Analytics. This post was teetering on the edge of obscurity. But what a shame! It had done so well. The URL itself had attracted links and mentions. A quick check on Search Console showed that 79 different websites had linked to it over the years. This is one of the most linked to URLs on this website. According to Moz, this was a post with a page authority of 49. That’s not bad! So here was a post with strong ranking potential, but without a little love, it was doomed to irrelevance. Time to save it, to bring it up to date, make it new. Time to update this old blog post. Warning! Do not change the web address when updating posts. If other websites linked to the original, you’ll break those links. This is bad for them and terrible for you since you’ll lose whatever authority and ranking potential those sites were passing to you. In this case, we would have broken links from several authoritative websites. That’d be bad for our SEO. To get a sense for what parts of the article to keep, go back and look at the comments, look at the social media shares and listen to your audience. Anything that got people talking is worth keeping. Although it’s mostly a re-written article, We started with an amazing first draft. It took a lot less time than starting an article with a blank screen. It was about half as much time as writing something new. Protip: To improve the quality even more, find the words that are semantically connected to your topic, and use those in the article. Follow these steps for semantic SEO and target the broader topic and just a narrow keyphrase. Here’s the list of phrases we found. Those that are crossed out were included in the update. “There are two ways to breath new life into old posts. First, use the old post as a base and create a fresh, stand-alone article. 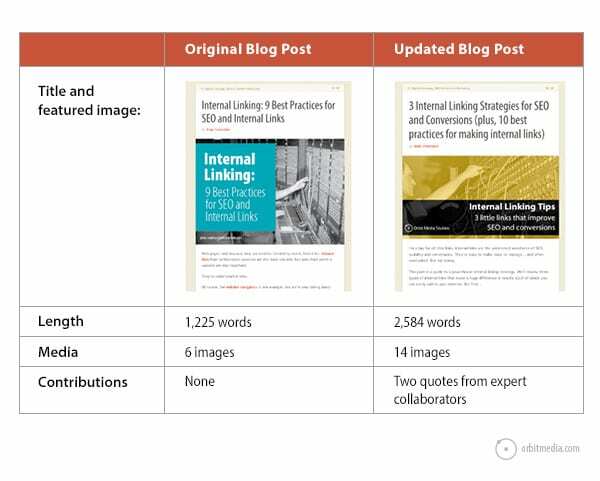 I did this recently for my most popular post on Content Marketing Institute: from the original with 2k words and 11 points to the update with 4k words, 19 points, and a downloadable PDF. An updated blog post also has an advantage in social media. You can quickly build a list of people to share it with on social media. And of course, share it with your collaborators and people who are especially interested in the topic. The updated post went live and was promoted through our newsletter and social channels, just like any new article. The impact was positive and immediate. 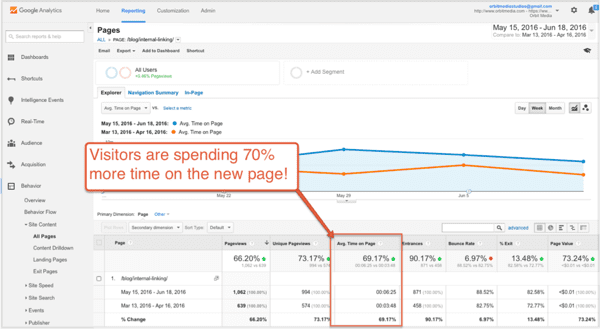 Visitors spend 70% more time on the updated article than the older version. Not surprising since considering the added length and images. The bounce rate dropped 7%. The downward trend reversed for every tracked keyphrase. The post moves from the bottom of page one to the top five positions across the board. After the spike of new email traffic, traffic settled down. And the new baseline is twice as much traffic as the older post. There you have it. Twice the traffic in half the time, by updating an old article rather than writing something new. Will Updating older articles work for you? This depends on a few criteria. If you can check these boxes, you’re ready to update and republish. Now go teach your old blog new tricks! Great story. Thanks for sharing specific data and the result — it’s interesting. Ideally, you don’t have dates in the URL at all. But if it’s already there, you’ve got a tough choice, Volodymyr. Probably, I would consider making a new post with a new URL …and promising myself to never point a date in a URL again! 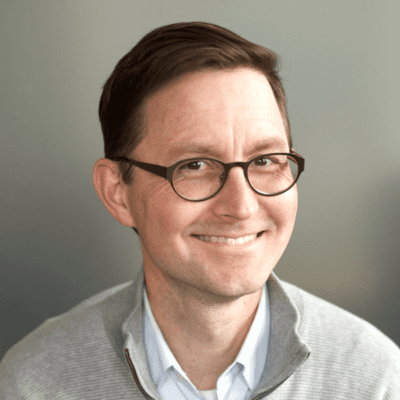 Andy – why couldn’t Volodymyr use a 301 redirect to update the posts? Yes, if you update a URL, you should create a redirect. Here’s how it breaks down. • Worst option: Change a URL that has been linked to by other site without creating a redirect …value destroyed. In this case I recommend to change the url and then do a redirect from the old url to the new url. The authority of your old post will not get lost in this case. Thanks, Heidi! I bet you have a ton of past posts that would benefit from a bit of a refresh. Great post Andy, some really good ideas here. Thanks for sharing! Awesome advice, as always, Andy! Question about updating a popular blog… what if the information from that blog post is completely irrelevant now and the URL has irrelevant info in it? Just leave it as is? Change info? We run into situations where content from a blog post could have completely changed. I LOVE this article, Andy! It’s so simple but yet effective. Plus, I’d argue one should give the blog a “refresh” from time to time anyway — that includes updating evergreen content but maybe getting rid of some “chaff” that doesn’t hold up anymore. Great advice, per usual, sir!